Conservation officer Micah Evans tells about his strangest deer encounter. AS CONSERVATION OFFICERS, we see all kinds of strange things while we go about our jobs. The funniest of these stories get told over and over, between wardens and police officers, as we find the laughter in our work. Last month, I encountered one of the most unusual and exciting experiences in my eight years on the job. 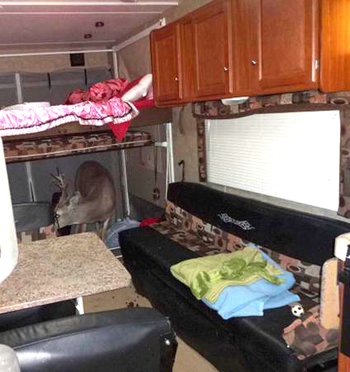 On Sunday Nov. 3, a woman was traveling through Utah to Las Vegas with her camp trailer. She’d been visiting the southern portion of the state and was taking the trailer home after the summer months. As she traveled north of Panguitch, she had the misfortune of hitting one of the many animals in the valley. She didn’t know what she’d hit. When she pulled over pulled over to check her trailer and truck for damage, she found a large hole in the front of her trailer, just above the hitch. For insurance reasons, she contacted the Garfield County Sheriff’s office to have an officer come write an accident report. A buck attempting to cross the highway ended up crashing through the aluminum siding of this passing trailer. I was shocked to see he was unharmed. I was patrolling the area and overheard the radio call asking for a Utah Highway Patrol trooper to respond to the accident. As with most vehicle/animal collisions, I knew I would likely get a call to find the animal and put it down if it was wounded too badly to survive. The driver wasn’t certain, but thought the animal was an elk, deer or maybe a cow. I was the closest conservation officer to the scene of the accident, so I decided to check on the situation until the trooper arrived. Once I got there, the first thing I noticed was the lack of damage to the bottom of the trailer. I checked on the driver and after ensuring she was okay, I looked at the large hole she pointed out. There were no clues as to what could have created the opening. I found a few hairs, but not any of the blood I’ve come to expect with vehicle/animal accidents. I told the driver that whatever she hit was likely still in the trailer and asked if I could go inside. I expected to find the mangled remains of an animal, so I asked the shaken driver to stay by her truck while I looked. I opened the door and peered into the master bedroom area of the trailer, but didn’t see anything. I entered cautiously, since I’ve learned to keep my distance from injured animals. I heard an animal working its jaw and tongue in the back portion of the trailer. I looked over the kitchen counter and saw a small, 2×3 set of antlers sticking up over the counter. From the antlers’ height, I guessed the animal was standing and doing well. I ran to my truck and grabbed my camera. I looked over the kitchen counter and saw a small, 2×3 set of antlers sticking up over the counter. I stood in the doorway, aimed my camera and took a picture. While snapping the photo, I remember thinking, “How am I going to get this deer out of here?” I thought I could come in from the back and maybe push the deer out the front of the trailer. The flash of the camera solved my dilemma. The deer looked at me, tilted his head and charged straight in my direction. I ran toward the back of the trailer and turned to face the door just in time to see the buck burst out. He hit the ground and slid about a foot. For a split second, he looked around and then took off like a shot toward an open field. The buck took two great leaps and jumped, superman-style, between two strands of barbed wire. Once he made it over, he hit the ground running fast toward freedom. I returned to the trailer and found that, other than some droppings, the buck had left little behind from his dare devil experience. The driver was relieved to see him run free. 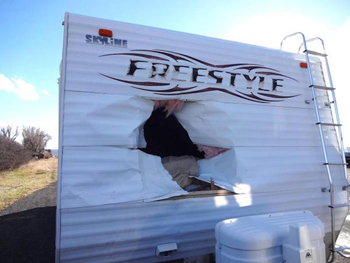 She returned safely to Las Vegas, leaving Utah with a gaping hole in her trailer and an unforgettable story she’ll tell for years to come. They don’t make trailers like they used to.